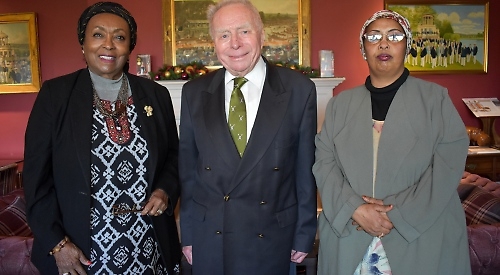 - Dr Edna Adan Ismail, a British-trained nurse and midwife who founded a hospital in the republic’s capital Hargeisa, was greeted at Leander Club by members of the Henley Borama Friendship Association. She was in Britain to collect an honorary doctorate from London South Bank University and was accompanied by Rhoda Ibrahim, the director of the Somali Advice and Forum of Information. Dr Ismail spoke about the hospital, which opened as a maternity unit in 2000 with only 26 trainee midwives but now delivers thousands of infants every year. It is also a university teaching hospital with 1,500 students, of whom almost three-quarters are female, learning a range of subjects including medical science, midwifery, dentistry and nutrition. Dr Ismail hopes to open a teacher training school and is currently seeking candidates who can lecture in teaching skills in English. She has known the association’s president Brig Malcolm Page for many years as she provides care for veterans of the Somaliland Scouts, the army unit in which he served. It was this connection which prompted him to launch the association in 1983. Brig Page regularly donates old-fashioned nurses’ watches to the hospital and these are given as prizes to the best performers. Dr Ismail, 81, said: “It’s a pleasure to see a good friend of many, many years who has been a great supporter of the hospital and of Somaliland both before independence and since. Somaliland is an autonomous region and self-declared state in Somalia which was formed in 1960 after it ceased to be a British protectorate.